Rich in colonial style, the luxurious 5-star Hotel Fort Canning offers complimentary WiFi, 2 outdoor pools and an exclusive pillow menu. 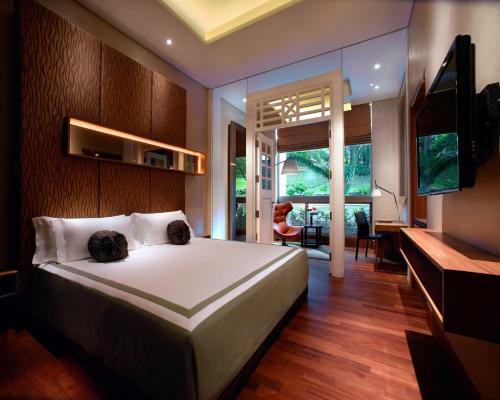 Make yourself at home in one of the 86 air-conditioned rooms featuring iPod docking stations and minibars. 42-inch plasma televisions with cable programming provide entertainment, while complimentary wireless Internet access keeps you connected. Private bathrooms with shower/tub combinations feature deep soaking bathtubs and rainfall showerheads. Conveniences include phones, as well as laptop-compatible safes and desks. Relax at the full-service spa, where you can enjoy body treatments. You're sure to appreciate the recreational amenities, which include 2 outdoor swimming pools and a fitness center. Additional features at this hotel include complimentary wireless Internet access, concierge services, and wedding services. Featured amenities include a business center, express check-in, and express check-out. Planning an event in Singapore? This hotel has 10764 square feet (1000 square meters) of space consisting of conference space and a meeting room. Free self parking is available onsite. With a stay at Hotel Fort Canning, you'll be centrally located in Singapore, steps from Park Mall and minutes from Battle Box. This 5-star hotel is close to Chinatown Heritage Center and National Orchid Garden. The preferred airport for Hotel Fort Canning is Singapore (SIN-Changi).